Lemongrass Oil is extracted from fresh, or partially dried, leaves of the Cymbopogon Citratus, by steam distillation. This perennial aromatic plant grows up to three feet in height and spreads a foot wide. It will flourish year round where the temperature stays 45 degrees or above. It goes dormant in the winter months and is not frost hardy. 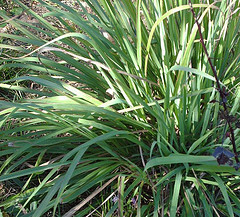 Lemongrass is found around the world in countries including: India, Thailand, Sri Lanka and Malaysia. It's widely used as a natural, holistic, approach to health and preventative medicine. It's not a replacement for prescribed medications. Some would prefer using herbs, like this one, to avoid adverse affects from conventional medicines. Lemongrass is rich in citral and vitamin C. It's in raw leaf form, capsules, powders, sprays, liquids and as an essential oil. The essential oil is dark yellow to reddish brown in color. It's a POTENT essential oil. It has an earthy, citrus, scent and a thin consistency. Lemongrass benefits the body, skin, hair and scalp! RECIPE # 1: Add 1 drop of diluted lemongrass essential oil to liquid make-up foundation. Smooth skin, hydrate and protect against environmental elements. RECIPE # 2: Soak in a tub with a handful of lemongrass leaves for a very relaxing bath. You can also add 2 drops of lemon essential oil, to bath water, to energize the skin. RECIPE # 3: (Relieve Athlete's Foot Fungus) Combine 5 drops of Palmarosa oil, 2 drops of Lemongrass oil, 2 drops of Patchouli oil and 2 drops of Tea Tree oil in a warm foot bath. RECIPE # 4: (Relieve Aches & Pains) Mix diluted lemongrass oil and diluted jojoba oil for a soothing massage. Alleviate sore muscles, aches and pains, Rheumatoid arthritis, tendonitis and back pain. RECIPE # 5: Use diluted lemongrass oil for minor cuts and scrapes. CAUTION! Essential oils contain bioactive ingredients. They contain natural chemicals that interact with biological systems. They're POTENT chemicals and should be used with care! Never use large amounts of essential oils externally, or internally. Never use them straight. They MUST always be diluted in carrier oil, or soap, lotion, or other buffering agent. Never use them without knowing what their bioactive compounds are known to do. CAUTION! Lemongrass may be skin sensitive to some. You may want to do a skin patch test, before using. If you're allergic to any ingredients, in any recipe, do not use. If you're pregnant, do not use. Keep away from children. If you experience any discomfort, discontinue immediately. Contact your health care provider, if needed. Your health care provider is the best source for your specific needs. Lemongrass is one of the most popular soap making herbs. A small amount of essential oil mixed in your homemade soap recipes adds a mild, yellowish-green, hue with a potent lemon scent. Lemongrass is a natural astringent. It minimizes pores and firms skin. It helps get rid of blackheads and relieve acne. It's benefits oily skin, acne, blemishes, dark spots, aged or saggy skin. Lemongrass oil blends well with: eucalyptus, geranium, juniper, lavender, sweet almond, jojoba, rose and other oils. A homemade soap with lemongrass oil, sage oil and bits of flax seed meal will cleanse, exfoliate, moisturize and invigorate skin! Find the specialty or soap making oil, right for you! -- Melt 7 oz. vegetable shortening, 30 oz. olive oil and 9 oz. soybean oil, in a stainless steel pot. DO NOT BOIL, BURN OR SCORCH! Heat to melting point. Remove pot from heat. Cool to approx. 95 degrees. -- In separate container make 17.5 oz. of Green tea, (using distilled water). Let Green tea cool. Pour tea in lye safe container. Slowly add 6.2 oz. of lye to tea, stirring constantly. -- Stir cooled, melted, shortening and oils into cooled lye-tea water. Blend mixture, thoroughly, with an immersion blender until trace. -- At trace, add 1 oz. Lemongrass essential oil and 1 cup ground oatmeal. Remove Green tea, (with lemon), from 10 tea bags. At trace, add loose tea, (from tea bags), to mixture. Mix all ingredients together. -- Carefully, pour mixture into prepared soap molds. Cover molds. Set molds aside from 24 - 48 hours. Remove soap from molds. Set soap on an air-circulated drying rack. Allow soap to completely cure, at least, 3 weeks. Do not use soap until cured. Enjoy! -- Peel outer leaves and cut bottom of, organic, lemongrass stalks. Wash stalks well. -- After liquid is cooled, place in dispensing bottles. Use lemongrass liquid only once or twice per week, after shampooing or conditioning. CAUTION! Do not over use shampoo, conditioner or hair rinse. Over use can cause damage to the hair and scalp. Hair may become weakened, dried out or brittle. The scalp may become dry or flaky. Also, it is best to let hair dry on its own or towel dry. If using blow driers keep a good distance away from hair. Blow driers should be kept on low heat or cool settings. Never use blow driers for extended periods of time. Blow driers can weaken hair, causing it to break or split. TEA: Lemongrass has been used in Chinese medicine for many years. Use lemongrass in tea to relieve colds, headaches, digestion problems. AIR FRESHENER: Lemongrass essential oil is in air fresheners. It purifies and cleans air. Use it as a blend in a potpourri. Blends well with eucalyptus, geranium, juniper, lavender, sweet almond, jojoba and rose. PET CARE: Place a drop of diluted lemongrass oil around the pet collar. Rub diluted lemongrass oil on palms through the pet's coat. Spray diluted lemongrass oil on outdoor pet pens. Repel fleas, ticks and other pesky insects. NATURAL INSECT REPELLANT: Some refer to lemongrass as the citronella plant. It's helpful for repelling flies, fleas, ticks, mosquitoes and other biting insects. Recipe # 1: Crush organic lemongrass leaves and rub on skin. Recipe # 2: Make a homemade lemongrass natural deodorant.